Sunrise Playground is named after the nearby Sunrise Highway, which played an important part in the development of eastern Queens and Nassau and Suffolk Counties. 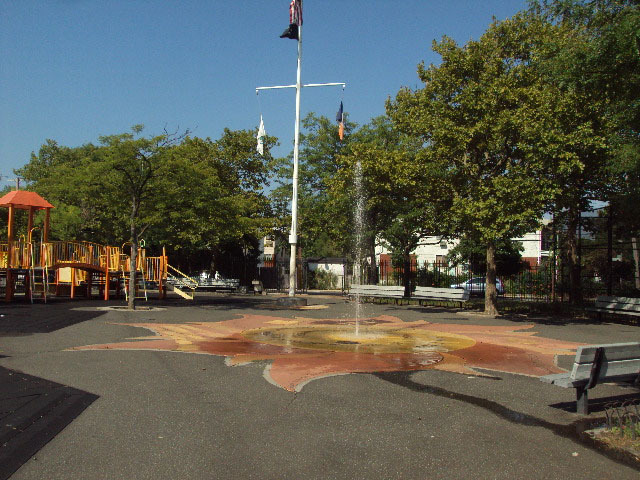 Located in the Queens neighborhood of Rosedale, the playground’s recent renovation, under the motto “Sunrise has not failed us yet” testifies to the neighborhood’s spirit. The Sunrise Highway was built in the 1920s astride an old conduit. The Sunrise was the first state highway in New York City and the first mixed traffic artery (including both commercial and private vehicles) to cross Nassau into Suffolk County. When the Highway was built the combined population of Queens and Nassau Counties was 600,000. By 1955, this figure had reached more than 3 million. The community of Rosedale lies to the north of the Sunrise Highway, just west of the Queens-Nassau County line. Delaware or Chippewa tribes first settled here, and Dutch and English farmers later arrived to take advantage of the good agricultural conditions provided by Hook Creek, a tributary of Jamaica Bay, as well as numerous other streams. Like many other parts of southeastern Queens, the arrival of the Long Island Railroad brought a long period of suburbanization to Rosedale. The Foster’s Meadow station opened in 1871, named after an early English settler, Christopher Foster. A real estate company renamed the community Rosedale in 1890. Although the origin of the name remains uncertain, some suggest that the name referred to wild roses bordering both sides of Francis Lewis Boulevard. The completion of the Sunrise Highway made it easier for more people to explore the outer reaches of the City. In the 1920s, a real estate boom brought an influx of Irish and German immigrants to Rosedale. After World War II, the neighborhood started to change with the arrival of Italian and Jewish families. In the 1980s, large numbers of Caribbean immigrants moved to Rosedale, most of them from Jamaica, Haiti and Guyana. This playground, located on 253rd Street between 149th Road and 149th Avenue and adjacent to P.S. 195, has been jointly operated by Parks and the Board of Education since 1962. It contains play equipment with safety surfacing, swings, benches, two handball courts, a flagpole with a yardarm and an aquatic animal art and sunrise theme. Most of these features appeared in the park following an $800,000 renovation sponsored by Council Member Archie Spigner in 1999.